As much as I want to like “Rabid Dog,” there’s a structural problem I have with it, a serious one, and I’m finding it difficult to move past that. See, Breaking Bad has always, until this point at least, been written and edited to suit an hour-long time slot. With commercial breaks factored in that gives us around 45 minutes per episode, and by and large the show has worked very well to make the most of its time. …hold on. Wait. I just checked and the episode was indeed about as long as any other. My apologies. It only felt like it was 11 minutes long, and seemed so convincingly short that I actually said the word “No…!” when the credits faded in. Yes, those first two paragraphs are just a hilarious joke. “Rabid Dog” continues the season 5 back-half tradition of every episode being significantly better than the already great episode that came before. I loved “Rabid Dog.” It managed, somehow, to be so packed with plot developments and artful narrative stalling, yet still felt incredibly short. That’s what happens when every second of your episode is used to its fullest potential; you get the whole chapter, but it’s still not enough. For starters, before we even get into anything that happened here, I want to take a moment to appreciate the framework of “Rabid Dog.” The episode begins as a Walt story, which unfolds in a straight-forward manner, looking neither to the left nor the right, until suddenly we snap right back to where the episode began…and this time it’s a Jesse story*. The paths converge toward the end of the episode, giving us a genuinely effective sense of impending clash. While the twin narratives do inform each other and fill in the gaps that we need in order to know exactly what happened, the point at which they come together is graceless by design, and dangerously so. The clean ending that we could have had is butchered by circumstance. A whole universe of “What if…” is born, and immediately dissolves before our eyes. First Walt and then Jesse are pulled along by the strings of fate, toward what could have been — whatever shape it would take — a full and complete resolution. For better or for worse both Jesse and Walt are given more time to ponder the kind of ending they want this story to have. Part of me — and I don’t mean this negatively — wondered if the structure of “Rabid Dog” wasn’t born in the edit, with someone getting the legitimately bright idea, in post-production, to split the two narratives and follow them both in isolation rather than cutting between them. I wondered this simply because Breaking Bad hasn’t really employed story-telling trickery like this before. It’s never needed to. I’d argue that it still doesn’t need to. But the more I think about it, the more I feel that “Rabid Dog” does need this. 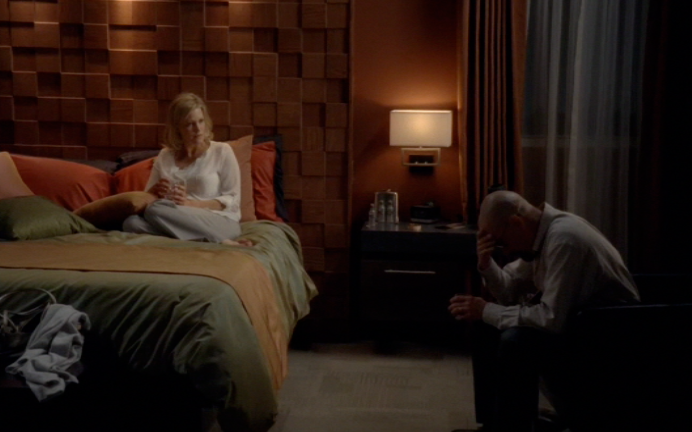 Walt is in isolation, with Skyler his only source of potential guidance. And Jesse is also in isolation, with Hank his only source of potential guidance. Neither of them want to take advice from these people…but neither of them have anybody else anymore. Cutting between the two would have worked just fine, I think, but by separating them completely we become privy, at least to some extent, to how that isolation feels. And what it means. Both Walt and Jesse are sleeping in strange beds. They’re cut off from the worlds they knew, and still don’t know what world they’ll know next. They’re stuck. I guess if I did have anything to complain about here, it would be a very minor gripe that, suddenly, Steve Gomez knows that Walt’s Heisenberg and that’s that. In one episode he doesn’t know anything, in this episode he knows everything. That’s a conversation that I would have really liked to hear, especially since we’ve spent three episodes dancing around the fact that Hank couldn’t tell anybody. Now he can. And did. And we didn’t see it and oh well I guess. Again, though, that’s nothing major…just a step that I really didn’t expect to see skipped. Four episodes down in the final batch, and four to go. Skyler wants Walt to kill Jesse, and Hank is prepared to get Jesse killed in service of his own agenda. The scene, by the way, in which Hank reveals to Gomez that he couldn’t care less what happens to Jesse was perfect. I like that as easy as it would be right now to turn Hank into a paragon of virtue — and as much as we’d like to see him that way as an audience — the show is making sure that we still can’t root for him without reservation. There is no good guy left on the show…at least not truly good. Just different degrees of bad…and different kinds of bad…for different reasons. Shades within shades. I wish I had more to say about “Rabid Dog,” but there’s almost nothing to do apart from list the things that I loved. Like Jesse unsure of whether Marie was Hank’s wife. Saul’s only, but absolutely classic, scene in the car. Skyler’s “What’s one more?” rationalization. The pump malfunction. The little girl hugging her daddy. I would have loved to have heard that conversation between Walt and Jesse on the bench. The one we were promised, and the one we all wanted. But Jesse stops before he gets there. He has another idea. Hank — and we — are frustrated. That’s what we needed to happen. Don’t worry, Jesse assures Hank, speaking for the writing staff. He, and they, have something better in mind. And I, for one, believe them. I just hope the next episode is a full 45 minutes. * Is there any other show in the world, by the way, that achieves such tension even when nothing is happening? Walt combing the house with his gun is just a gigantic mislead, and not even a surprising one, but the entire sequence is tight as a fist. Thinking back, the show has had a lot of moments like this — the twins sitting on Walt’s bed come instantly to mind — and they’re all incredible. How many shows can successfully make nothing feel like a heart attack? I have to confess that this was the first episode of this run that left me a little underwhelmed. It looked like we were headed to the Walt/Jesse confrontation at the end of last episode…and yet that was delayed for more tinkering by the writing staff to move everyone into the right place for the finale. I’ve no doubt that this is meticulously planned (like everything in this amazing show), but I’d have preferred them to have ended the last episode maybe a couple of minutes earlier (before Jesse got to the house). It’s great that the show can play with expectations but there’s only so many times we can teeter on the edge and then edge away from it. The other episodes have teased and paid off in equal measures (particularly episode 9), but this felt like one long tease. One thing I did love was Marie researching poisons. Someone else has broken bad! Walt is like a black-hole and everyone around him is being dragged into darkness. I have a theory that the last episode will just be Walter Jr standing in the wreckage of the world and searching for corn-flakes. I enjoyed the episode, but, like Pete, I didn’t like it as much as the previous one. I tried to put my finger on why, and I couldn’t. Maybe my nerves were already too frazzled from the 3DN contest to be taken for their customary ride by the episode. I did enjoy it, though. It did break my heart that by one little misstep–Jesse’s mistaking of the bystander-father as a hired badass–Walt has made the final turn and has resolved to take out Jesse with everyone else. Their loyalty to one another has been a thin thread of humanity that’s run through the show… I guess it has to be a two-way street or nothing at all. The “Talking Bad” show they are tagging on later is pretty comical. Nothing bad about it, really–it’s just completely useless. It just shows how eager fans of the show are to discuss it… they’ll even tune it to watch others watch it, even if they can’t join in. I’ve been doing it too. Crazy, man! p.s. Thank you, Noseless Chatter, for teaching me to use the HTML code for italics. How did the 3 Day Novel thing go anyway? Congrats on even trying! I’m not trying to take away from your heartbreak, but I guess I never really bought that Walt had any loyalty toward Jesse to begin with. I think he BELIEVED he did…but I’ve spent more or less the entire run of the show just waiting for the circumstances to become tangled enough that he’d turn on him. I don’t think he was particularly fond of Jesse…he just had a protegee he could bend when he needed to have him bent…and that was the appeal. The Walt / Jesse dynamic has only ever been one-sided…the few times he has demonstrated loyalty to Jesse it’s either been short-lived or it’s still been for Walt’s own benefit. As a viewer I want it to be two-sided, and I think we all do, but I’m pretty sure it never was. It may have been a bald man in the plaza that finally got the switch to flip, but if it hadn’t been him it would have to have been something. Both Walt and Jesse, I feel, were looking for an excuse at that point. I’m not saying you’re wrong when you mention that their loyalty to one another has been the thin thread of humanity. If anything, I might be the one who’s misreading the situation. But I love that even something so clear cut (the relationship between the two main characters that we’ve seen develop over five seasons) is still up for legitimate debate. I can’t bring myself to watch Talking Bad. I can’t think of anything more disrespectful after an episode like “Rabid Dog” than to deliberately choose to look at Chris Hardwick. I see what you’re saying about the give and retract cycle of the show that gave us the yes he will / no he won’t of Jesse burning the house down, and now another one of the yes they will / no they won’t meeting in the plaza. And I agree that could get tiresome, particularly if you boil it down to its plot points. But I guess what I saw here wasn’t just a buildup to a meeting that never happened. It felt like a really well-handled exploration of character. What it would take for Skyler to become fully complicit, what it would take for Jesse to actively turn on Walt, how much Hank is willing to gamble in terms of other people’s lives, what it would take for Marie(!) to consider murdering another human being…and, of course, what it would take for Walt to order a hit on Jesse. I really do feel like “Blood Money” was actually One Long Tease…a full episode dedicated to getting two characters into a garage, so the episode could end and we could open there next week. But “Rabid Dog,” while just as teasing, worked very well — imho — to serve mainly as an interesting discussion of these characters along the way. And with so little time left, I felt the questions being answered (even if we didn’t realize we had them) were very welcome. I’ll also say that while I was disappointed that the meeting in the plaza didn’t happen, I am absolutely convinced that whatever happens instead is going to be much better. I don’t feel short-changed or tricked at all…I feel enthralled. I think it’s because we’re galloping towards the finish line and I’m preparing for it to explode…but, like Jesse in the White abode, it seems hesitant to light the match. It’s got to the point where I want Walt to finally embrace the darkness and become the truly bad person he’s been threatening. I loved his antics with the gun at the beginning of the episode, but this was a character who clearly didn’t know what they were doing as they entered that house (compared to, say, Mike RIP) so it came across as comical. I guess that’s the brilliance of Walt – that he’s never been quite as good at being bad as he’d like to believe, but I think it’s necessary now with the end in sight. I’ve seen a couple of episodes of Talking Bad and the best compliment I can pay is that the actors come across very well and seem to truly understand the show and the characters they play. Anna Gunn, in particular, surprised me in her insight to the Skyler/Hank diner scene and acknowledged the fact that the character, in her early days, acted as an essential obstacle for Walt – and the viewers. What was it you said, Phil? That this show is literary television? Man, do I ever think this episode backed that up. Nothing more to add, just that the shoe sure does fit. Previous Previous post: What is Detective Fiction?